WASHINGTON, D.C. -- Twenty-one percent of Americans name some aspect of government that dissatisfies them as the most important U.S. problem, replacing immigration at the top spot in Gallup's monthly measure of the question. Twenty-two percent had named immigration as the most important problem in July amid the political furor resulting from the Trump administration's policy of separating children from their parents who crossed into the country illegally. President Donald Trump signed an executive order in late June to end this practice. Still, 16% of Americans currently consider immigration the nation's biggest problem. The drop from July to this month occurred slightly more among Republicans (from 35% to 22%) than Democrats (18% to 10%). In each of the past five monthly polls, immigration and government have been the two most-often-named problems. At least 19% have listed problems with government in every monthly poll this year, and at least 10% have named immigration in six of the eight polls. Only once this year have at least 10% mentioned any other problem -- in March, when 13% named gun control in the weeks after the deadly Parkland, Florida, school shooting. Two percent now list gun-related issues as the nation's most important problem. This follows the pattern in recent years in which topics such as race relations and terrorism rise to more than 10% of "most important" mentions immediately after major news events concerning those issues, and then decrease in mentions as the events recede into the past. As happened with gun control, mentions of immigration as the biggest problem have risen and fallen in concert with news coverage. The emphasis Trump has given to immigration, both as a candidate and as president, has thrust it into the spotlight at various points over the past few years. But as few as 4% or 5% have named it as the top problem in some of the months since Trump took office. Trump's election also has affected perceptions of government as the nation's top problem. In every month since he was inaugurated, at least 19% have named it as the most important problem, driven primarily by Democratic unhappiness -- as evidenced this month, when 32% of Democrats mention government-related issues as the top problem, compared with 12% of Republicans. The average percentage of all Americans mentioning government for the 19 months Trump has been in office stands at 21%, five percentage points above the 16% overall average for the second term of his predecessor, Barack Obama. The averages are 11% for Obama's first term in office, 8% for George W. Bush's second term and 5% for Bush's first term. For the third consecutive month and for the ninth month of the Trump presidency so far, less than 20% of the public lists any of the nation's economic issues as the most important U.S. problem. The number of economic mentions dropped below 20% only four times during George W. Bush's two terms and not once during Obama's two terms. The shift from economic to non-economic concerns does not always mean the public is less worried about economic issues -- non-economic problems such as the Iraq War, terrorism, crime and healthcare have all topped the most-important-problem list at times when Americans have shown more concern about the nation's economy than they do now. With midterm elections less than three months away, Americans are far from united in their beliefs about the biggest challenges facing the nation. But perhaps more importantly from the standpoint of this year's candidates for Congress, there is in each party an issue by far most often mentioned as the nation's most important problem. One-third of Democrats (32%) say the current government is the biggest problem (many of them directly mentioning the Trump administration), while 22% of Republicans say it is immigration. With the White House and both houses of Congress under Republican control, Democrats have emphasized the nation's problems as they have attacked the Republican Party on a number of issues -- including racism, healthcare, the environment, and the gap between rich and poor. 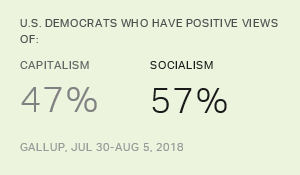 Each of these issues gets mentioned by at least a few Democrats in polling on the nation's top problem, but none at nearly the same frequency as dissatisfaction with the government. The next few months will tell whether these issues, all of which enjoy strong support among party members, will be what Democrats in key Senate and House races home in on. The obvious alternative: concentrate their campaign efforts on the well-documented frustration Democrats feel toward Trump, his administration and the Republican Congress. August marks the fifth month in 2018 that at least 35% of Americans have been satisfied with how things are going in the country. This is the most months in any calendar year since 2006. Americans remain unhappy with Congress, with 17% approving of the job the legislature is doing, unchanged from July.